It is that time again. My annual Beyond the Triple Crown series top ten list is back in full swing and Union Rags got his much deserved Classic in the Belmont Stakes as I predicted. He has been my top ranked Triple Crown series colt since last November and remains the top dog after getting back on the beam under new pilot John Velazquez. The Test of Champions was only the beginning of things to come from the talented Matz trainee. A marathon is obviously not his best trip but he figured to handle it based on stamina influences on the female side of his pedigree and class pulled him through. The Travers Stakes is the main summer goal for Union Rags with a prior pit stop in the Jim Dandy or Haskell. Paynter is the new kid on the block and he came through with flying colors in the Belmont Stakes. He made the pace but could not hold off my troubled Derby top when the real running began. Baffert is looking at the Travers for the son of Awesome Again as well. 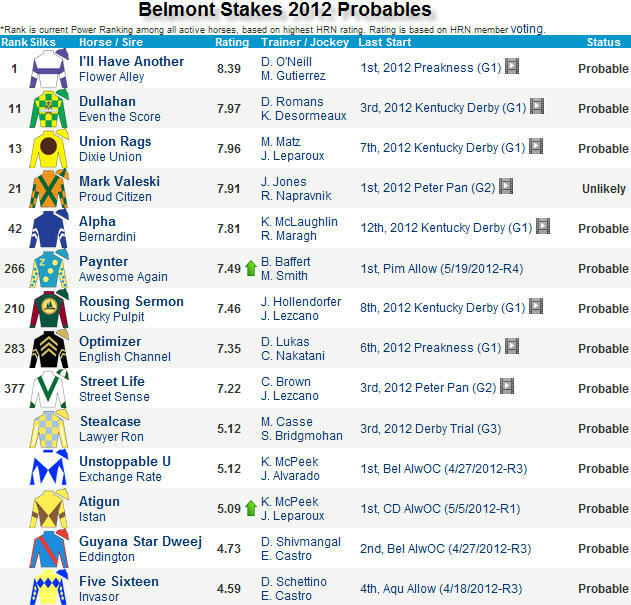 Baffert also has Derby-Preakness runner-up Bodemeister for the Haskell. A few parting words on I’ll Have Another. It was a shame that he missed the Belmont Stakes and subsequently retired but part of the Triple Crown challenge is the ability to withstand the rigors of three races in five weeks. It takes a very sturdy horse to make the gate in Kentucky, Maryland, and New York. I never believed that I’ll Have Another was going to sweep the Triple Crown. The last eleven horses to go for the Triple Crown sweep went down in flames and there is a reason why horses exiting the Preakness have only managed two wins in the last fourteen editions of the Belmont Stakes. He is the clear leader of the sophomore division and it will take a huge second half by Union Rags to take the title away from him. 1. Union Rags (Dixie Union) – I refused to drop him from my top spot after troubled trips in the Florida Derby/Ketucky Derby and my stubbornness was rewarded in the Belmont Stakes. We have not come close to seeing his best and I am looking for a big second half. 2. Bodemeister (Empire Maker) – The Derby-Preakness bridesmaid was tuckered out after his 3rd race in 5-weeks at Pimlico. His early speed is especially dangerous up to nine panels and he could prove an elusive target in the Haskell. 3. Alpha (Bernardini) – Leg infection after the Wood Memorial probably contributed to his 12th place Derby effort. He spiked a fever and missed the Belmont Stakes. He is currently stabled at Saratoga with the Jim Dandy a possibility. 4. Gemologist (Tiznow) – His perfect record went down the tubes in the Derby but he came out of that with a foot bruise. He is back in Pletcher’s barn with an eye on the Travers. 5. Hansen (Tapit) – Juvenile champion finished 9th on the first Saturday in May. He could show up in the G3 Iowa Derby on 6-30, followed by the G2 West Virginia Derby on 8-4. He fired a 5f bullet in 1:00.60 (1/14) over the Churchill training track on 6-16. 6. Paynter (Awesome Again) – Gave Union Rags a run for his money in the Test of Champions. Baffert’s lightly raced colt should continue to develop. He could resurface in Saratoga’s Jim Dandy on July 28. 7. Dullahan (Even The Score) – Kentucky Derby show finisher flopped in the Belmont. He loves Keeneland’s Polytrack and is a competent turf performer as well. Look for him to possibly resurface in the Virginia Derby at Colonial Downs on July 21. 9. Went The Day Well (Proud Citizen) – G3 Spiral Stakes hero finished a troubled 4th in the Derby. My Preakness top flopped in the second jewel and seemingly had nothing left to offer after his aforementioned bad trip two weeks earlier. 10. Holy Candy (Candy Ride) – Expecting big things from Sadler’s late developing colt. He exits a needed show finish in the G3 Affirmed and probably goes next in G2 Swaps on July 4. Breezed 4f in :49.60 (25/36) at Hollywood Park on 6-13. How sweet it is. Union Rags received a ground saving trip and ran down a game Paynter in the final strides to capture the 144th Belmont Stakes at Big Sandy on June 9. I have been touting this horse since last September and it was great to see my Derby top redeem himself under new pilot John Velazquez. He has been my top ranked Triple Crown series contender since last November and I never lost faith after a pair of troubled journeys in the Florida Derby and Kentucky Derby under Julien Leparoux. Michael Matz did a great job preparing the strapping son of Dixie Union for the Test of Champions and he received stamina from the female side of his pedigree as predicted. This was the start of a big second half of 2012 for Union Rags and it is on to races like the Travers, Jockey Club Gold Cup, and Breeders’ Cup Classic. I hope to catch up with him in person at Santa Anita Park in the fall! Which horse has the best pedigree to handle twelve furlongs in the final leg of the Triple Crown on Saturday, June 9 at Belmont Park? 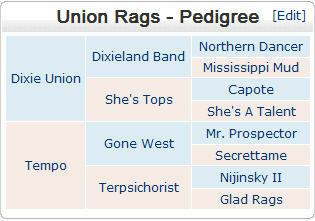 My Belmont Stakes alphabetical list continues with Union Rags. Union Rags’s late sire Dixie Union (by Dixieland Band) won the G1 Haskell in 2000, defeating Captain Steve and Milwaukee Brew. He also captured the G1 Malibu in his final career start and sired 39 stakes winners from his first eight crops including Gone Astray and Grasshopper. Dixie Union’s offspring are usually effective up to a mile and an eighth. Dixie Union’s sire was Dixieland Band (by Northern Dancer), a Maryland-bred horse I remember when I first started following racing in the early 1980’s. Dixieland Band won the G2 Pennsylvania Derby and G2 Mass ‘Cap. He also competed in the 1983 Belmont Stakes and finished 14th.